TUCKED away at the end of some steep and narrow lane Hodnet might have become a show village like Selworthy in Somerset, but because it stands at the inter­section of two main roads-Shrewsbury to Market Dray ton and Wellington to Whit­church -its charms are hardly noticed by the motorist who speeds by. Yet it is Shropshire’s finest Tudor village, with rows and rows of black-and-white cottages with their pretty front gardens. Some still preserve their thatch; others lost it in a series of fires some thirty years ago and are now tiled. Leland, writing in the time of Henry VIII, said Hodnet was” neither a town nor a village.” but Leland was a late-comer in the life of Hodnet. The compilers of Domesday wrote of it as Odenet, and before that Edward the Confessor made it the centre of a Saxon Hundred. To-day Hodnet is a mixture of ancient and modern, but the periods do not clash. Modern council houses are grouped on the fringe of the village at the junction of the Wellington and Shrewsbury roads and are distinguished by an attractive layout. 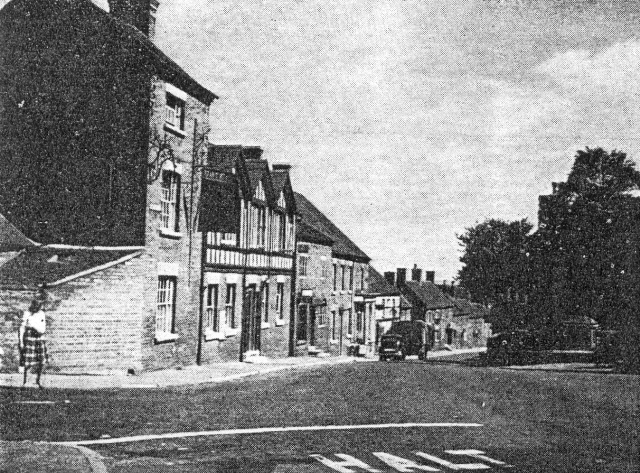 The two main streets are mostly composed of ancient buildings and at the crossroads stands the half-timbered Hundred House, fronting on a miniature square, which the ‘buses make their stopping place, and, a further modern touch, the travelling fish-and­-chip shop dispenses its wares. The road through the square leads to the ancient parish church of St. Luke and to the back drive to Hodnet Hall. The main drive is some distance away on the Whitchurch road, where the stately eighteenth ­century mansion, designed by a pupil of John Nash, stands at the end of a splendid avenue of limes. There has always been a great house at Hodnet, but little is known about the original home of the de Hodnets, who flourished there for more than two centuries. Accord­ing to Eyton they were descendants of the great baronial house of Fitz-Warine. and it is recorded that Sir Baldwin de Hodnet joined Fulk Fitz-Warine in his rebellion against King John, got outlawed for his pains, and in due course was pardoned. The only remains of the old Norman castle are a few fragments of masonry on a tree covered mound in the hall grounds. The de Hodnets were succeeded by the Vernons, a noble family also associated with Tong. 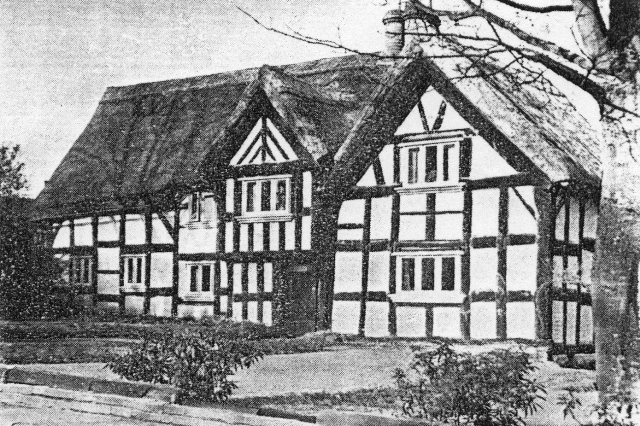 Most of Hodnet, as it stands to-day must have been built in the days of the Vernons but little is known about the acti­vities of members of this family. Evidently the male line failed, for in 1722 Elizabeth Vernon, eldest daughter of John Vernon and heiress to the manor and estates of her grandfather, Sir Harry Vernon married Thomas Heber, from Yorkshire, a descendant of Oswald Heibre, a commander in the Yorkist army, who fell at Wakefield in 1460. Emily, the bishop’s daughter, married in 1839, Algernon Charles Percy, son of the Bishop of Carlisle and grandson of the first Earl of Beverley. He took the additional surname of Heber by royal licence and that is how the Heber-Percys came to Hodnet. 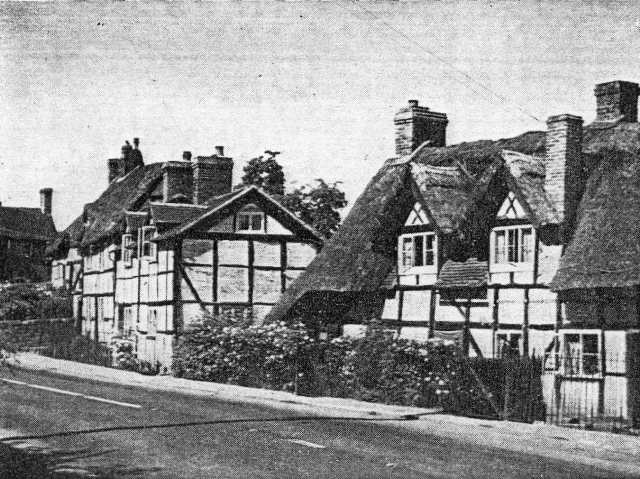 Old people in Hodnet still talk about Major Algernon Heber-Percy, under whose rule Hodnet was regarded as a “last strong­hold of feudalism, and its squire described as a “benevolent despot.” Certainly the villagers, who were all estate tenants, had to mind their P’s and Q’s when Major Algernon was about. But this despotism was largely a pose, for Algernon had a soft heart and he and his good lady are remem­bered for their many kind actions. At the ­village school, for example, the children always had hot cocoa and buns on wet, cold mornings, and there was a pair of slippers for every child with instructions to the schoolmaster to see that their boots were dry before they went home. Major Algernon, who served for many years on the Salop County Council, had in his time been a great big-game hunter. He filled the entrance hall of his mansion with trophies of the chase brought from India, the Rocky Mountains, and Eastern Russia, where he shot by special permission of the Czar. The present squire is his grandson, Briga­dier A. G. W. Heber-Percy, D.S.O., a Grenadier who commanded a brigade of Guards in the North African campaign, and is now at home, following his hobby of landscape gardening. His long-term plan, begun even before he joined the Army, has transformed the hall grounds. The ter­raced gardens look down on a chain of ornamental pools which have been made by damming a small stream which runs down from the Hawkstone hills. Surrounded by gay flower beds and furnished with every kind of aquatic plant, the pools are a source of delight to the visitors who are admitted on most Sunday afternoons during the summer. Brigadier Heber-Percy recently broadcast on the rarer shrubs in his garden. 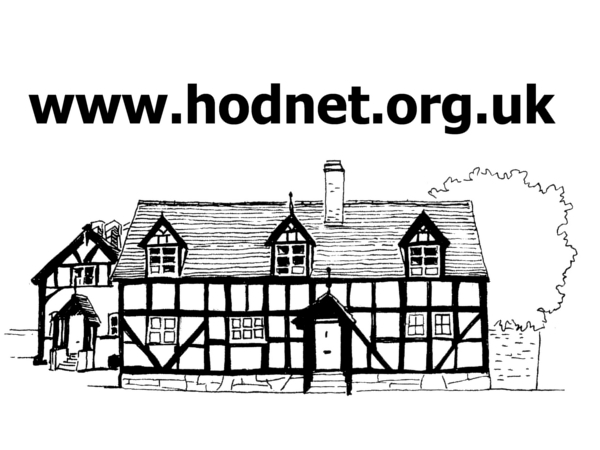 In late Victorian and Edwardian days Hodnet was a stronghold of Conservatism. It still is. There was a Liberal invasion in the early 1900’s, when Mr. Alfred Neilson, challenger of the sitting Member, Colonel Kenyon-Slaney, took a house at nearby Wollerton, and his supporters held meetings at the Bear assembly rooms. One of the fiery young speakers of those days is now a dignified county alderman and vice­ chairman of the County Council. Liberal eloquence, it must be recorded, made no impact at all upon the sturdy Conservatism of Hodnet. The social life of Hodnet has developed considerably in the last forty years. Mr. Fred Gillebrand, who came as schoolmaster in 1906, and retired nine years ago to the fine old Tudor house opposite the church, has observed and taken part in the develop­ment as chairman or secretary of many local organisations, to say nothing of being clerk to the parish council for some thirty-odd years and church organist for longer than that. 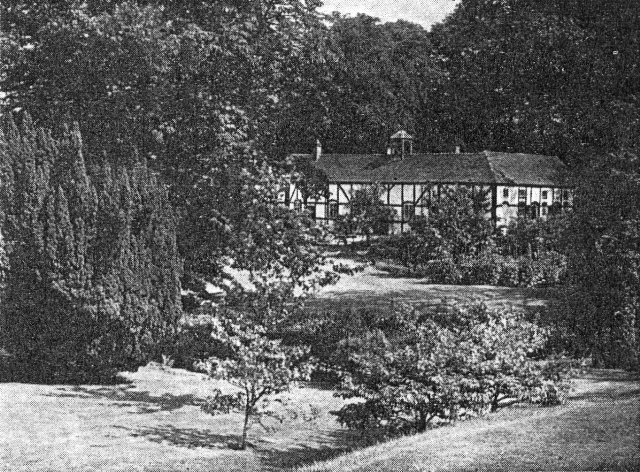 Mr. Gillebrand recalls that in 1907 he arranged the first whist drive to be held in Hodnet. This then novel form of entertain­ment was so popular that a second drive had to be held to take the overflow. Nowadays whist drives are so common that they have ceased to be news. The Lyon Hall, completed in 1914 as a memorial to Dr. Lyon, a beloved figure in the village, is the centre for most mixed social activities. The first use to which it was put was not that for which it was intended. For the duration of the 1914-18 war it was the home of a Belgian refugee family bearing the name of Torreele. There were three generations of them, numbering fourteen in all. Not long ago one of the Torreele children, now a prosperous Belgian business man, came over to meet old acquaintances in Hodnet. Up to 1907 Hodnet had its own company of Volunteers, 100 strong. How a country village managed to recruit so many men to serve without pay is difficult to understand in these mercenary days, but Hodnet did it and some of the amateur soldiers won more than local renown as rifle shots. Among them were William Huxley, the barber, Harry Spencer, the saddler, and Jack Price, a farmer, who all won prizes at Bisley. Colour-Sergeant of the company was Robert Clunas, veterinary Surgeon, who lived at the Hundred House and was an outstanding figure in the life of the village for many years. He also served as captain of the local Fire Brigade, was a pillar of the Wollerton Congregational Chapel, and in later years made his presence felt on the Salop County Council. He served in the First World War and attained the rank of Major. In those days Hodnet was proud of its volunteer fire brigade, which had an old manual engine drawn by a pair of horses which had to be rounded up from grazing when a night call was received. During the 1914-18 war, when it was difficult to obtain horses, the engine was drawn by a pair of mules which were kept in the park. In the tap-room of the Bear old villagers often re­late with glee the (probably fabulous) story of how one night the driver who went to round up the mules came back with a mule and a cow. Nowadays Hodnet has a brand ­new fire station with mechanical equipment. There was a German-Swiss butler at the Hall in the days of Major Algernon who bore the unusual name of Zumbrunnen. His sons-Fritz, the newsagent, and Arthur, the grocer – for many years shared with Messrs. Thomas and Charles, drapers of the dignified old school, much of the business life of Hodnet. Fine craftsmanship in wood was and still is the tradition of the France family. Arthur France, who died not long ago, executed many commissions from far afield and left behind him evidence of his skill in the oak panelling of the parish church. Reginald Heber was not the only Hodnet rector to become a bishop. John Ralph Strickland Taylor, who was rector from 1928 to 1932, afterwards became Bishop of Sodor and Man. He has lately retired. The present rector is the Rev. W. V. Griffiths, who used to be senior chaplain to the Brigade of Guards. 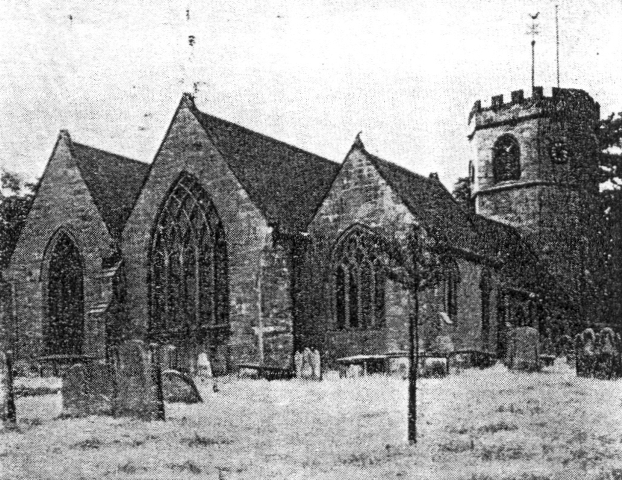 Hodnet parish includes in its wide boundaries the picturesque region of the Hawkstone hills, but this article is already long enough and Hawkstone must wait for another occasion.